Taylor Swift returned to the cafe where she was discovered to give a surprise performance. There is nothing Taylor Swift loves more than surprising her fans. The 28-year-old visited Nashville a few days ago and stopped by the cafe where she was discovered as a teenager. 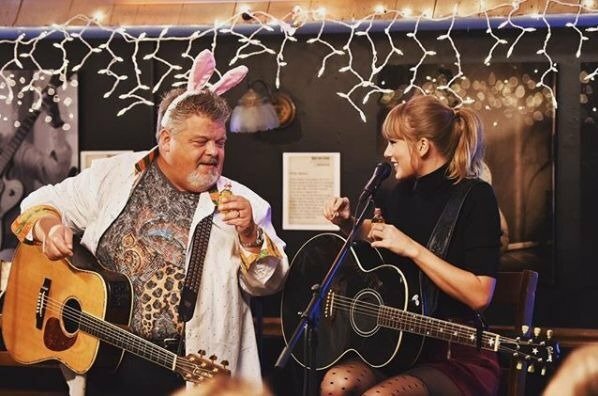 Country songwriter Craig Wiseman was performing at the Bluebird Cafe, and after a few songs called out the 'Look What You Made Me Do' hitmaker. The pair did fireball shots while onstage. "Went back and played the Bluebird Cafe in Nashville! I played there for the first time when I was 14. There were bunny ears and [tumbler glass emoji] this time, thanks to Craig Wiseman," she captioned a picture of her performance. Some cafegoers shared videos of Taylor singing 'Shake It Off' and 'Better Man'. Taylor's appearance will reportedly feature in an upcoming documentary about the Bluebird Cafe, which is celebrating its 35th anniversary. Several top musicians have performed at the historic cafe, which opened its doors in the 80s, including Keith Urban, Steven Tyler, Willie Nelson, Sheryl Crow, and Jewel. A Twitter user shared a throwback picture of Taylor's performance at the cafe 14 years ago. Taylor Swift is gearing up for her 'Reputation' world tour which kicks off in Arizona on May 8. The 51-concert show, which will also make stops in Europe, Australia, and New Zealand, features support acts Camila Cabello and Charli XCX. Fans are looking forward to watching the Grammy Award-winner performing hits from her latest album, 'Reputation'. 'Delicate', the fourth single off the album, is currently at number 19 on the Chamberlains Top 20.